Remember that week when I purged my entire bathroom of chemically laden products and replaced them with natural alternatives? I was blown away by the amount interest this has generated as well as the outpouring of information being shared. Thank you. 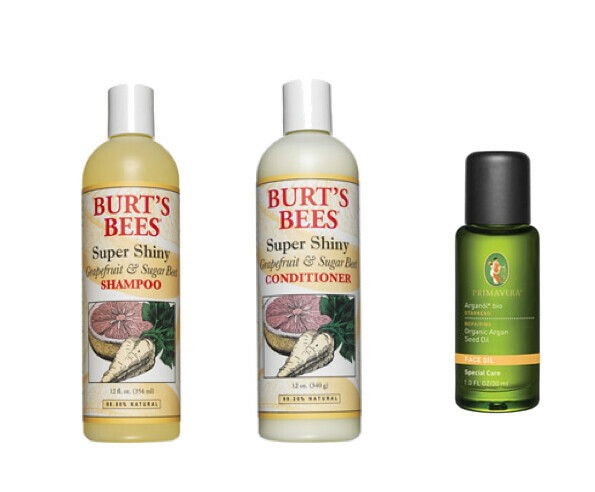 After obsessively reading the reviews on Makeup Alley, I decided to try Burt's Bees Super Shiny Shampoo and conditioner. Instead of using my usual Phillip Kingsley Elasticizer, I've now turned to pure organic Argan oil. Truthfully, I was a little apprehensive. My first attempt at using a so called natural hair shampoo was a disaster. The residue build up was awful after using it twice. My scalp was unbearably itchy and my hair was greasy. Here's a little lowdown on the Shiny shampoo and conditioner. They contain no sulfates, silicone and paraben amongst a long of list of no-no chemicals. It's made of predominantly citrus, sunflower and coconut oil as well as sugar beet extract and soy protein to nourish the hair. My Asian hair is really thick and coarse. It has a tendency to frizz and is slightly dehydrated. Yuck. After using both products for 2 weeks, I can safely say that I'm impressed. So, what do I think of the shampoo and conditioner? 1) the shampoo lathers well. Sorry. I still love seeing plenty of bubbles. I'm conditioned to think that plenty of lather equals clean. 2) despite the fact that my hair doesn't feel silky soft probably due to the lack of silicone, it's shiny. The first couple of days were spent in front of the mirror tossing my hair from side to side just to see the shine. You would too if you haven't seen your hair looking this good in a while. 3) I was a little worried when I rubbed the conditioner in. I guess I wasn't used to the lack of "creaminess" if you get my drift. However, my hair is remarkably manageable and so easy to style after a quick 5 minute blowdry. 4) I've got really long hair so I massaged 2 drops (instead of 1) of organic 100% pure Argan oil into my hair (not the scalp). My 3 step haircare - shampoo, conditioner and oil seems to work very well for now. 5) The fruity fragrance can be a little overpowering at times but I'll tolerate it as long as I have my shiny hair. I purchased my Burt's Bees shampoo and conditioner from echemist.co.uk. I haven't been particularly impressed with the company. The service is slow. None of the bottles were bubble wrapped. The cap on the shampoo bottle was smashed during shipment and liquid spilled everywhere. Not cool. When I called their customer services, I had to take photos to provide evidence. The replacement shampoo they shipped out did not arrive as promised nor the day after. In future, I'll just buy from my favorite online store feelunique.com. P.S. I'm not affiliated with Feel Unique. I've been their loyal customer for the past 2 years. i didn't know this particular company so thanks for sharing with us i'll google them and check it out. by the way can u do me an immense favor? i have the chance to collaborate with boticca.com a jewellery brand but to do that i need to send them traffic by my blog, and this can happen only if people click on the boticca.com link i provide in my newest post, just click nothing more. it would mean the world to me if you just clicked on the link, it would be so helpful since i don't have hundreds of fans to help me out. The shampoo sounds good enough to eat!!!! super shiny hair is a dream come true , I'll check online if these products are available in Italy also. I think that other products with argan oil will do the trick , if I can't fine these ones. I actually just use generic organic argan oil. No other added chemicals. There are quite a few online companies that ship worldwide for free. I just picked up one of their lip salves and loved it, I'm looking for a new shampoo my present one is too expensive and not worth it. Tabitha, I'm not too impressed with Korres lip balm so I'll give Burt's Bees ones a go. Thank you for the recommendation. A friend of mine tried Giovanni (the one I recommended a couple of weeks ago) and she said it was great. interesting thanks for doing this.. i've been thinking about switching to organic hair products for awhile.. but i'm too use to my regular pantene pro-v.. everytime i try something else.. my hair doesn't look or feel the same.. and i always end up going back to it.. even though i'm pretty positive pantene is like REALLY bad for you hahah. I've heard so many great things about the Burts Bees range and have been meaning to try their bodywash. I thought they were available at Boots or am I mistaken? Parveen, I don't recall ever seeing Burt's Bees products in Boots. Not the one here anyway. However, they're stocked in most online stores. Lol then I am mistaken :) will definitely be buying some of their products though! After my first experience, I was so put off by natural shampoos. Thankfully, I gave it another go. Let me know how it works out for you. I've used burt bee's chapsticks and love it, I like the natural smell of it. Might have to looking into their hair care line. I always like to dry out new conditioner. I like Burt's lip balm and their eyecream. Doesn't get rid of my panda eyes but it's moisturising enough for night. I wake up the next morning with my eye makeup going on smoothly. I'm thinking of getting their shampoo too.